Now also a 64 Bit version is available. Depends on the installed bitness of the Microsoft Office version. 32 bit Office installation has to use the 32 bit competition software version. 64 bit office installation has to use the 64 bit competition software version. Mix of bitness is not supported by Microsoft. Competition software version depends on Microsoft Office version. Check this first. rainer.skater(ADD)t-online.de. If it is a reinstalltion or an upgrade no key is requested. Fixed crash when export all results to XML. Fixed crash print seeding list. Only 32 Bit Office installations are allowed or 32 Bit MS Access runtime. Competition software will not work with installed 64 Bit Office or 64 Bit MS Access runtime. Cooexistence of 32 and 64 Bit Office on one machine is not supported by Microsoft. Improvement of american relays. Choosable storage path for certificates. 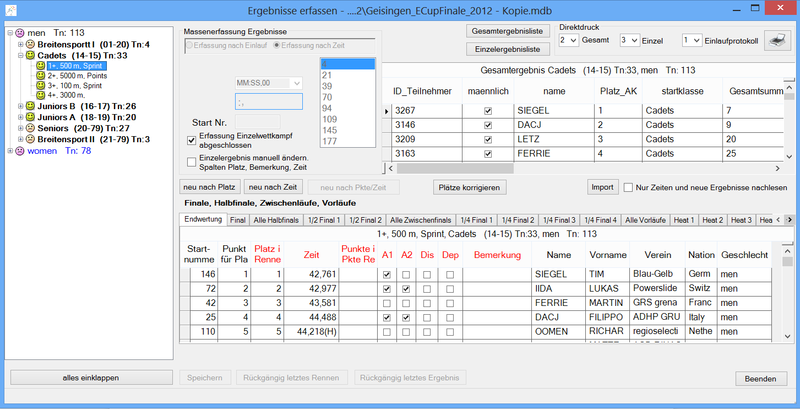 Transfer results between races and also competitions (databases) added. ECup competitors in key data enabled again. After hard testing at arena Geisingen international and in Groß-Gerau this version is now approved for using. The key is valid for the rest of the year. Every calendar year a new key is required. THIS IS NO TRIAL SOFTWARE and it is under copyright protection. Only a technical release. No functional upgrade. Connection to Microsoft Access database new implemented (32bit and 64bit support). Microsoft NET framework upgrade from 3.5. to 4.5.1. Also all visual objects are upgraded to neweset version and crystal report upgraded to Runtime 13_0_24 including support for 64 bit. Microsoft ended support for the JET access module that the competition software used for communicate with access database and for using excel files (import, certificates, export, ..). The JET access module was removed now and replaced by the MS Access Runtime engine. In the new setup you can now decide wheter to install the runtime module or not, but only if MS Access is not already installed on the machine. If you do not install the Runtime Module and you have no MS Access installed the competitioon software will not work. The MS Runtime is part of the deployment and can be found in the instrallation folder as "EN_AccessRuntime_x86_2016.exe". It can also be started as stand alone setup. Now starting lists for final and heats. Better Layout for the lists. Earlier the certificates have to be place in program CERIFICATES folder. Often the user has a security problem, when he wants to place a new mail merge certificate word document in this folder. Now you can chosse the path inside the settings dialog. If you import ECup competitors there is a new configuration to automatically translate from uppercase to mixed case of the names. This can also be done afterwards in the competitors registration dialog by using the context menu (right mouse click on registered competitors list). If you call a result list allways a pdf file is now written to the database folder in subfolder "exportPDF". You can use this for example to publish results manually to an WhatsApp group or for publishing manually to a webserver. This export is also generated if you use the online result service. If you generate the next starting (seeding) list you can now import (paste) a list of starting (BIB) numbers into field "BIB No or List of BIB No's by serpentine". The heats are filled by serpentine. You can also import a list by paste it into "BIB No or List of BIB No's to heat" field and the selected heat is filled with this start informations. Excel columns (copy/paste) are also allowed as list. In the past you got an error while printing of result lists when a scheduled race before the actual race was not recorded. This is now possible. French language is now supported. The program and the lists are now automatically in french language when your windows localisation is "Fr". German, if your localisation is "De". In all other localisations the standard language is english. If you prefer every time english you can do this by renaming the localisation folders (Fr, De) in the the program folder to anything you want. If the program do not find the prefered localisation folder it switches automatically to the english language. Please note that the report language can be changed in the configuration of the competition. So you can mix program language and report language. Setup is changed. The additional programs for the reporting (CR Runtime) system and the results service (Altova) are now part of the setup. If you install first time with the new setup this two additional programs are pre selected. Later setup/updates don't automatically install this additional programs, but it can be selected. Support: This version is still running from windows XP till Windows 10. Please note that the support for the XP version will be discontinued beginning with the next version. When you export (right klick) results in the recording dartagrid, then you can import this export into an other datagrid, also in an other competition. Often this is needed for events with seperated databases like sprintcup and the rest. Also now the import of the ECup competitiors in the Key data is now possible again. Final A,B,C in combination with ascender and descender like used in Geisingen and Groß-Gerau now available. New Web Resultservice with better support for small devices. Support of IOC Flags when recording competitors. "Mass copy" of competitors to one heat in the seading dialog. Implemented check of export folders if they reside in a protected folder like "Program files". Bug fixes. Bug fixing. In seeding dialog and in recording results dialog you can now also print a speaker list that is sorted by bib no. CSV Configuration for time meassure systems will now displayed again. Choosable using of country names. Select now between long names or alternativly IOC short cut names. In General Settings is a new option for. If you decide "long name" then in the competitor recording the nation drop down box will show long names. When editing nation column then right beside will automatically be displayed the corresponding flag. This flag is then also displayed in the result service. In General Settings you can configure the path where the flag pictures are stored on your web server. The flags can be found in the "flags" folder after installation. ranking in 500 m is done by place and time in the rounds. But in the qualification round now only by time. automatically ranked by time, the other rounds by definition. 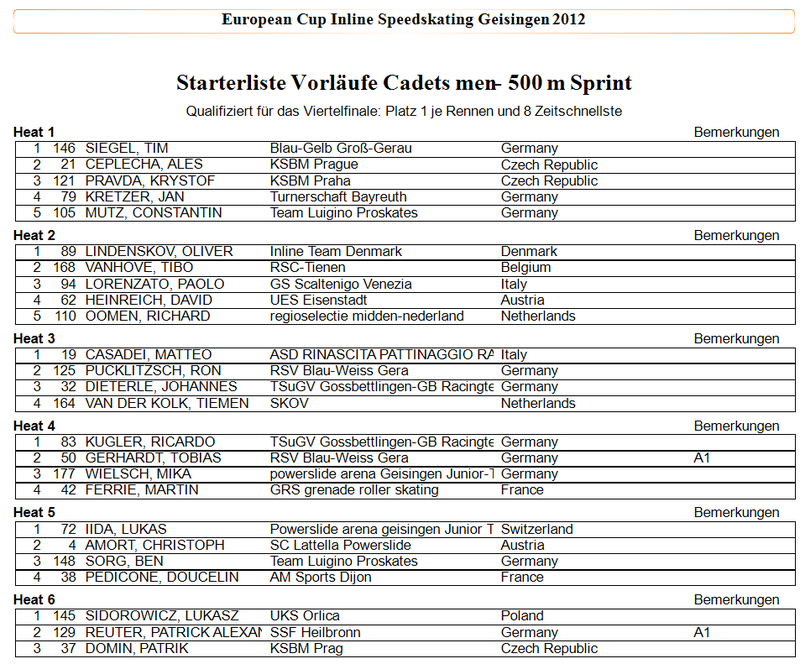 Export ECup Results was updated, because second short distance was missed. Import competitors from excel now eliminates unvisible chars like CRLF, etc. recalculated by the definitions of the target competition. the application to print again. This is corrected. Certificates are now also available for Windows 8 users. Some bugs of the preview version fixed. Known problem is using word with windows 8. After calling certificates the application hangs. Correction is in progress. First Version with english language support. 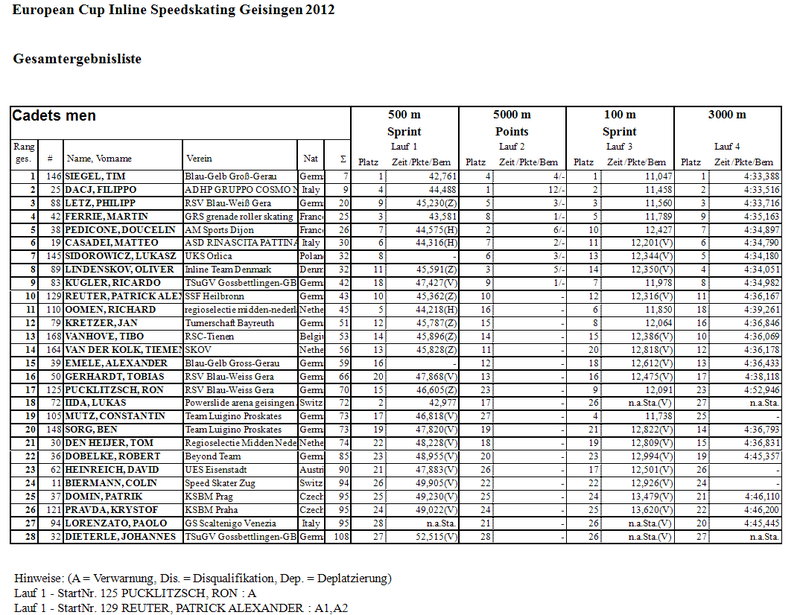 First designed only for Germany, the Inline Speedskating Competition Software (ISKCS), is now used also in Switzerland, Belgium, Austria, Italy and Czech. 5. Gather the results or import from the time meassure system. Supporting all types of races.